Self Help Guru Reveals The Truth About Eternal Life! The Self Help Guru Who Created A Story About Eternal Life! Read the story of a self help guru who discovered the truth about eternal life. On this page I’ll reveal the story of an ordinary man who discovered the secret of eternal life. And how this man, who was so inspired by his discovery, proceeded to create a story similar to those we know by such names as the Holy Grail, the Elixir of Life and the Fountain of Youth etcetera. We’ll journey into this man’s mind to consider the secret he’d discovered and the mystery which has always surrounded such stories and ideas. Together, we’ll dive in and look closely at the understanding which naturally follows for those people who, throughout history, have discovered these ideas for themselves. Join me as we use our minds to rationally reasonably and logically integrate our own understanding and our own knowledge, in order to reach the same conclusions as this self help guru. And then together, we’ll discover how and why such stories as the Holy Grail came into being in the first place! And finally we'll look into the idea of death and ending. Self Help Guru Insight – What’s In a Name? He was an ordinary man born into a reality populated for the most part, by beings who’d deliberately chosen to forget their true nature. Those people were such stupendous creators that they’d created a reality in which they really believed that they were "victims of circumstances" and as such they truly believed they were devoid of any real power! This man, for reasons which were unclear to him, had always been asking the big questions concerning life and the nature of existence. And due to his unending and unsatisfied inquisitiveness, in jest, his friends had often labeled him as a guru. His own perspective was more in line with the label of a seer (to use a word), as someone who sees things which others apparently don’t see. He became known for helping people to help themselves and so his reputation amongst the people was indeed that of a self help guru. As time passed and as he grew older and wiser he was certainly able to assist many people with their various challenges. Of course he knew that all personal challenges stemmed from that part of one's self affectionately known as the tricky or mischievous monkey, otherwise simply known as the ego-self. Once upon a time some 2,000 years ago in a parallel reality not too dissimilar to that of the earth - a man, who was generally known as a self help guru discovered for himself the true nature of existence, including the idea and the truth concerning eternal life. Actually, initially it wasn’t really a true self-discovery as he’d studied the writings and the life works of many seers who’d come before him, who'd reached the same understanding. So in a sense he had a great advantage and a head start in joining all of the dots necessary in order to make the big picture complete. And he was eternally grateful to those who’d come before him and who’d left trails of dots to be joined, in the form of breadcrumbs so to speak. And his passion now consisted of condensing the knowledge revealed by dot joining, so that others had the opportunity to see truth in a faster, easier and more playful manner. Nevertheless, it was a true self-discovery in the sense that integration of all ideas and truth can only be realized first hand and not exclusively through someone else’s efforts or mere say so. The self help guru knew that all knowledge must be remembered on a personal level! This man known as a self help guru, upon discovering the truth about eternal life and wanting to share it with his fellow beings was faced with a huge dilemma. You see, in his world the people had chosen to incarnate for the purpose of experiencing the epitome of self-imposed limitation and thus, self-limitation was prevalent throughout every society on his planet. And although he realized that the end of that self-imposed negative cycle was nearing the end, indeed completion of it was imminent. He also knew that the people were yet to remember that their own definitions and beliefs concerning reality were, actually, what caused their reality to be experienced in the way it was, in the way they’d chosen it to be! The self help guru realized that, in general, the idea of death or any kind of ending was a big issue for his people. The seer reasoned that - if one man, even if he was a self help guru, out of every 100,000,000 men came out and said: brothers and sisters, fear no more any ending because your idea of death is all skew-whiff and there’s no such thing as ending or death, who’d believe him? Given the people’s lack of comprehension and their many and varied beliefs in ideas of heaven and hell and their notions of the afterlife, he was faced with a seemingly insurmountable dilemma. He felt like he had to find a way to help those who were asking and who were willing to discover the truth of eternal life for themselves, first hand. With his now heightened sense of awareness the self help guru realized that people’s beliefs, which had been handed down from generation to generation for millennia, were the reasons for the widespread ignorance or mass hypnosis on his planet. Throughout history, people were born into society and then they generally accepted and adopted the beliefs which were prevalent at the time. In the current paradigm most people believed that death was something real, something to be afraid of and therefore nobody wanted their life to end. Thus, the seer reasoned that one way to inspire them to allow themselves to rediscover the true nature of existence was to create a series of stories about the idea of achieving eternal life. People rarely questioned or inquired within to find out for themselves, first hand, if any particular belief really served them or if it was even helpful. Thus, a plan was born and the self help guru began telling stories of mysterious ways in which eternal life can be achieved. Back in those days, all stories were spread by word of mouth and, typically, people would adjust and embellish those stories with their own added content. This embellishment merely added to the mystery of the secret of attaining eternal life. And it added more color and stronger desire to inquire into such ideas and stories as the Holy Grail, the Elixir of Life and the Fountain of Youth etcetera. The seer’s plan began to unfold... Here’s a list of life extension-related topics to research, if you're interested. The reasoning and the purpose behind the self help guru’s plan was simple in nature. It relied upon the certainty that the Universal law of attraction, by its very nature, would yield positive results to those seekers of knowledge and understanding who were pure of heart. That is to say, he knew that when asking clearly without distortion the LOA must bring answers. He knew that anyone with the desire and the willingness to discover for themselves the truth behind the stories of the Holy Grail, the Elixir of Life and the Fountain of Youth etcetera, by the very act of their inquiry they’d attract the means of discovering the truth of eternal life to themselves. Throughout history many people on his planet had discovered the truth and the fact of eternal life. Many have searched for and have found the Holy Grail, the Elixir of Life and the Fountain of Youth etcetera. And upon the discovery of what eternal life actually means, those who discover it find themselves with the very same dilemma as the self help guru did so many years before. This knowledge cannot be passed on from one individual to another; it must be discovered and realized first hand. Thus, those who discover the truth about eternal life realize what a brilliant idea it was to create those allegoric stories in the first place, and so they leave them in place awaiting others to discover them. Because anyone who’s discovered for themselves the truth about the nature of existence automatically understands that, like many other ancient texts, the story of the Holy Grail is allegoric in nature and they realize that that truth and that knowledge can’t be passed on, although clues, signs and breadcrumbs can be left for others to find. It’s allegoric because we already are eternal beings and we have always been eternal beings and so, by definition, we have always existed and we always will exist! Like the self help guru in the story, I’ve discovered some of the truth concerning the nature of existence. I’ve begun to break free of my self-imposed and self-limiting belief systems, some of which I’ve had since I was a child. I didn’t do it alone and neither do you have to! Relax your mind, by staying in the present moment or by meditating and then go inside and get in touch with the part of you which you’ve forgotten exists. Reconnect with your spiritual or higher mind and receive the intuition, inspiration and insights that will always serve you well! When we only use our rational mind, without the input, clarity and greater understanding of our higher mind or higher spiritual self, we complicate life and the understanding of reality no end! Life is fundamentally very simple. Move back towards simplicity and reconnect with your higher spiritual self to gain clarity and peace. 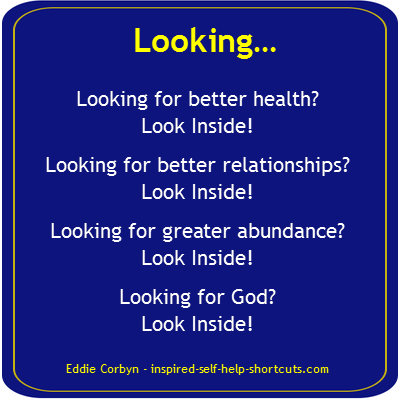 To go deeper into these ideas and to become clear about who we really are, please read through the inspired self help guide page / Spiritual Guide section. Many years ago I started contemplating my own death. I used to fear it and so I would avoid thinking about it at all costs. Anytime someone I knew died it would upset me a lot and those funeral wakes just added to my overall discomfort at the idea of my own inevitable physical death. These days I simply smile at the idea of death. That being said, it’s quite challenging talking to those people who haven’t seen through the charade of death, because they’re still operating from the perspective of their ego-self and so the idea of death is indeed frightening for them. Although I was inspired by stories of eternal life such as those outlined by the ideas of the Holy Grail, the Elixir of Life and the Fountain of Youth etcetera, my personal understanding of the idea of eternal life was finally arrived at through advanced reason and logic. Read what these self help authors say about death. For twenty years or so, I read countless books by such authors as Richard Bach, Carlos Castaneda, Jiddu Krishnamurti, Abraham-Hicks, Deepak Chopra, Bashar, Eckhart Tolle, Neville Goddard, Mike Dooley, Neale Donald Walsch and Alan Watts etcetera. And through the action of researching the ideas portrayed by those, in a sense, self help guru types I realized that what fears death is the ego-self personality construct. The ego-self is otherwise known as the tricky or mischievous monkey or the lonely frog by the pond that’s cut off from the flow of life. On a deeper level I realized that space and time are artificial constructs which are held together as real by the ego-self, which is itself an artificial construct which fears its own ending! There’s no time outside of the present moment for you not to exist within. Of course, I’m referring to your spiritual essence, which is who you really are at your core. You’re a spiritual being who’s projecting a part of yourself into this illusional space-time physical reality in order to have an experience within it. 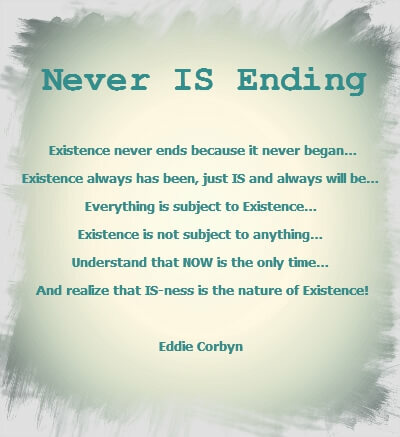 Once you grasp the fact, the truth and the reality that the present moment of NOW is all there ever is and is all there ever has been, you’ll come to the logical conclusion that because you exist now you have always existed and you always will exist, and that’s eternal life! Finally, be your own self help guru by remembering and realizing your total being and who you really are. Your ego-self or the personality construct of your physical mind is an artificial construct that’s only designed to perceive how life is and how life has been for you on this physical plane of reality - it's not designed to see the future! When you think about it, your ego-self personality construct is nothing more or less than a bundle of past memories which are held together and maintained by your present thoughts. It must be that way because from this perspective it’s obviously not made up of your future thoughts. Your ego’s job is to send the data of your current perception back to the greater part of you, your spiritual self, and to receive data from it, so it’s a feedback loop. Realize, therefore, that it’s not that your ego-self dies, but rather that due to change being the only constant in life, your ego-self is forever changing. And thus then, as a whole being you realize that you can never remain the same. Once you realize this fact, the fear of death will diminish and ultimately vanish from your experience and you will relax and enjoy your life more thoroughly. Your ego-self cannot reach this conclusion by itself, but once you’ve fully reconnected and reintegrated with your higher mind or higher self, then, over time, your ego-self personality construct will willingly relegate itself to the position of a faithful servant and it will no longer "try" to control everything.